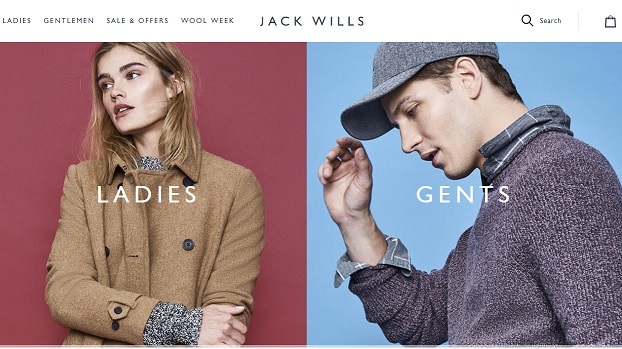 Sign up for free and just shop with Jack Wills as normal. Our average member earns over £300 cashback a year. Jack Wills cashback can be earned simply by clicking through to the merchant and shopping as normal. Jack Wills Cashback is available through TopCashback on genuine, tracked transactions completed immediately and wholly online. Shop for fabulously British goods, get the latest look and save money thanks to our Jack Wills promo codes and cashback deals. The online catalogue of one of the UK's leading clothing brands features both men's fashion and women's fashion, including everything from blazers, coats and dresses to hoodies, jackets and jeans. They take pride in using the finest quality materials, techniques and design to deliver a collection which makes a connection between old and new. Update your wardrobe with leggings, Salcombe shirts, shorts, sweatpants, T-shirts or a top, while you will also find clothing accessories, shoes and boots, underwear, loungewear, gifts and lifestyle items. Search their sale items section for great offers on popular products for ladies and gentlemen, while students can save with their student discount. Those looking to make a saving on their order will find that the best way to get a Jack Wills discount is by shopping through TopCashback and getting money back, however by buying tactically and combining our offers with others you can make an even greater saving. One of the best ways is to check out a Jack Wills sale event, andwith many held throughout the year you’ll see different reductions offered in each. Their Mid-season and winter sales tend to be the best, with an expected up to 60% off a selection of lines, while you’ll see up to 50% off everything during their Black Friday event. Smaller savings are available too, with the likes of flash sale weekends with 25% off, money off a spend deals, as well as pre-Christmas three for two on gifts. All offers can be shopped easily via the sale tab on site, but anyone wanting to be the first to hear about Jack Wills discounts, offers and events can sign up to their email newsletter. Additionally, savings on getting hold of your order can be made, and by spending over £60, you get access to free standard delivery or just opt for no minimum purchase, free click and collect. The first Jack Wills store was opened in Salcombe, Devon, in 1994. While their handbook, logo and mail order system were in place from the start, their logo had to be ironed on to some of their clothes by hand. Seven years later and a second store was opened in Aldeburgh, which was quickly followed by shops in Guildford and Richmond, while the same year saw the launch of the website, which included the JW chat room. A big year in 2005 saw their head office move to west London and Jack Wills host a fashion show at Kensington Roof Gardens. The year also saw a new store in Portobello open, while by the end of 2005, they had established 10 stores across the UK. The pheasant was adopted as their official brand logo in 2007, along with the now iconic pink and blue stripes. Also in 2007, Jack Wills opened their first townhouse concept store in Marlow. Two years later and their head office was relocated to larger premises in London and the original Salcombe store expanded, while four new shops were launched. The Covent Garden store was relocated and expanded in 2010 as it became Jack Wills' flagship UK store, while the same year saw them open three stores in America. The global expansion gathered pace in 2011 with the opening of two stores in Hong Kong and eight more in America, while Kuwait and Dubai were added to the list in 2012. One year later and pop up shops were implemented, while Jack Wills launched their blog, their first mobile responsive site and the JW app. The brand expanded further in 2014 through new stores in Singapore and Macau. Jack Wills are determined to do the right thing for their employees and customers, whether that involves developing relationships with British manufacturers, following the principles of ethical trade or supporting charities they believe in. Their aim is to provide the 'highest quality goods' and only use factories which meet their standards. Their clothes are designed in the UK and sourced from places like India, China, Portugal and Turkey, and they are members of the Ethical Trading Initiative (ETI), which promotes workers' rights. As a result, all of their suppliers must commit to a code of labour practice, which sets measurable standards for wages, working conditions and employment rights. You can choose from three options when it comes to getting your hands on what you have ordered. They offer free standard delivery on orders of £60 or over and your items should be with you in 3-5 days. If you need them to arrive sooner, you can select next day delivery (excluding Bank Holidays) if you order before 8.30pm Sunday-Friday. You can track your parcel by entering your tracking reference at yodel.co.uk., while if you checked out while signed in to your Jack Wills account, just log in and click 'Order History' to check its progress. As an alternative to home delivery, their Click & Collect service will allow you to buy online and pick up your order from your chosen store for free. If the item is in stock at your chosen store, they will do their best to make it available for collection within a couple of hours, while if it has to be sent to the store, it will take up to three days. They will email you when it is ready for collection and you will have seven days to pick it up. You must show the collection email when you collect. What Is The Jack Wills Logo? The distinctive Jack Wills logo depicts a pheasant wearing a top hat and holding a cane. It is thought to have been chosen to represent their British heritage-inspired clothing range. Where Are Jack Wills Clothes Made? Jack Wills design their clothes in the UK and source them from all over the world, including countries like China, India, Turkey, Portugal and the UK, though they only use factories which live up to their exacting standards. Is Jack Wills Cruelty Free? Jack Wills are strongly committed to ensuring all of their materials are sourced responsibly, including raw materials which come from animals. They have a detailed animal welfare policy which covers hair & fibre, fur, feather & down, leather skin products, shell and animal testing. Suppliers are required to commit and give assurances that they will adhere to this policy and have a compliance process which covers this. The first Jack Wills store was opened in Salcombe, Devon, in 1999 by Peter Williams and Robert Shaw. The company handbook, logo and mail order system were in place from the outset, although the logo had to be ironed on to some clothes by hand. You don't need a degree to work out that these Jack Wills cashback deals offer great value for money. The company design British heritage-inspired goods for the university crowd and continue to be influenced by the best of British. They take pride in using the finest quality materials, techniques and design to deliver their distinctive connection between old and new. Shop online for men's and women's clothes, from dresses to tops and T-shirts, as well as homewear and accessories.